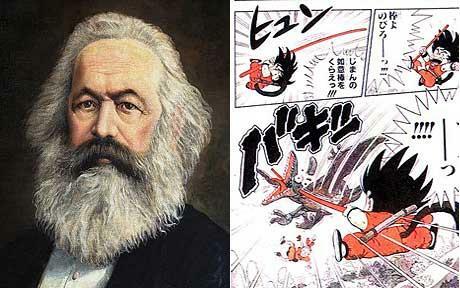 1) As Danwei's original post mentioned, there's been a popular manga out in Japan based on Marx's work. You can see a story about this and one sample illustration from it here, but it is worth noting that long before the Marx manga, there were the illustrated "for beginners" books by the cartoonist Ruiz, who had a field day with Mao's thought as well as Karl's life, times, and ideas..
2) Even better (if you like cartoons that move) is the Marx mash-up to end all Marx mash-ups, the video called "Manifestoons," which uses images taken from classic works of animation to illustrate the points made in "The Communist Manifesto." 3) Not quite in this same category, but still worth a mention, is the report by the Financial Times' Geoff Dyer that the Dalai Lama's speeches have "been played on the dance-floors of London nightclubs." Alas, there's no video of said dance hall performances provided by the FT, though the pop culture hungry will find a nifty color caricature drawing of the Tibetan spiritual leader provided at the start of the piece, as well as an unexpected but illuminating juxtaposition of celebrities in a comment by Pankaj Mishra, who is quoted as saying that the Dalai Lama "seems as ubiquitous as Britney Spears" these days. 4) The Olympics Opening Ceremony wasn't exactly a mash-up, but we did get to hear songs from the Chinese Revolution mixed in with tunes of more recent vintage and more bourgeois lineage, with a quote from Confucius thrown in, so surely it can get a nod here. And the critique by one Chinese blogger, mentioned on this site in piece we ran by Geremie R. Barmé, that the show was supposed to be like a "banquet" but ended up merely like "hot-pot" is much the kind of thing that would be said about a mash-up gone astray. 5) Last but far, far from least, there's the one-of-a-kind, won't even bother trying to explain it (just click to watch it) Monty Python sketch that brought together Marx, Mao and Che (among others) to participate in a quiz show that touches upon such crucial texts of classical revolutionary theory as...the songs of Jerry Lee Lewis. As always, I enjoy the posts. The link for the Monty Python sketch currently takes us to amazon.com, same as the 1) link. Thanks for the catch on the doubled-link, Eric...it has been fixed and now should take you to the video of the Python sketch. "but we did get to hear songs from the Chinese Revolution mixed in with tunes of more recent vintage and more bourgeois lineage..."
I think you got it wrong. one thing the opening ceremony missed was the theme of revolution, or the theme of history in last 100 years. That song is about chinese "socialist" country, not about revolution. Didn't realise that was based on Marxism...I grew up reading that series. Have I been brainwashed! ?